We've been used to the notion that money was essentially credit. But after observing how credit moved over the past few months, our usual definition of money now stands corrected. Money now should be defined as spent credit or moneyspend. The reasoning is very simple. You can have $1 trillion dollars but if you sit on it, that money doesn't affect the economy one whit. It's dead money. It must be spent to qualify as real money. Paul Krugman, always lost in the trees because of too much thinking about the forest, has recently come out with another of his naive statements: "Remember, the US government can't run out of cash (it prints the stuff)." 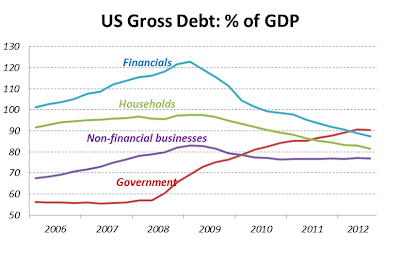 Now if you consider moneyspend as the real money, you can see why Krugman's talking with his sleep mask on. Surely, the US government can't run out of cold hard cash (dead money) but it has limits on how much it can spend (real money). Another more confused person, Ben Bernanke, is pushing the Fed's holdings of Treasury bonds and Mortgage Backed Securities (MBS) to US$4 trillion from the current US$2.86 trillion. In return he'd be dishing out more deposits to banks and other financial institutions. We've been through this before and we know where this would lead to. Ben mistakenly believes that deposits (another dead money) can be conjured into spending (real money). There's another money conjuring trick carried out lately by non-financial business corporations. We know that equities are also money but they are safe money because their value move in tandem with the credit quantity. So there's no point in monitoring them. 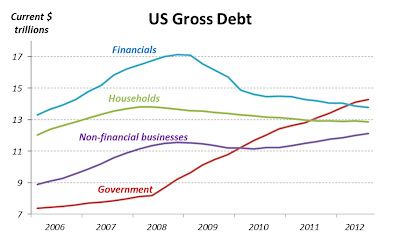 Debts in contrast are toxic money, that is, when economic conditions deteriorate. In current conditions, you must get rid of debts by all means regardless of how cheap they can be. But because of Ben Bernanke's manipulation of the interest rates, the business corporations have been lured by the siren song of cheap interest rates to raise bonds in order to buy back equities. Bond interest costs are now dirt cheap (see chart at left) while equity returns are expensive. In swapping equities for bonds, the business corporations are pushing equity prices higher despite the gloomy earnings forecasts. But the financial risk of bonds increases as the depression looms nearer. 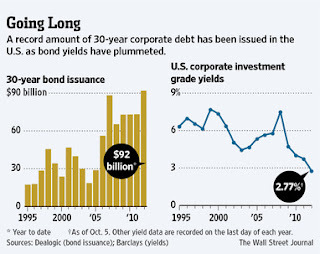 If you're thinking of putting your money into equities or corporate bonds, don't. No matter how profitable a business is right now, its income will plummet with the collapsing credit. Only the rare few will continue registering profits. CEOs will soon realise that the external environment will overwhelm them regardless of their business savvy. Even now an increasing proportion of investment-grade new bond issues are those with credit ratings at the low end of the investment grade (see charts below). The business corporations' switch to bonds for their funding has been received with open arms by the investment funds who lap up the corporate bonds in the erroneous belief of their low risk (see charts at left). Actually the better bet is the government bonds of the strong national economies, such as the US and Germany but their available supply is getting less and less as central banks mop them up through their quantitative easing. Furthermore, the austerity drives undertaken by many governments limit the supply of new government bonds. Equally troubling is the dubious safety of the MBS purchased by the Fed. Of its US$1 trillion new quantitative easing, US$620 billion will be for MBS and US$500 billion for Treasuries. As house prices are expected to begin their decline soon, the MBS is as safe as the flimsy guarantees of Fannie Mae and Freddie Mac. To put it simply, the US government will need to widen its deficits in the near future to rescue both institutions so as not to drag the Fed down with them. Bernanke's cheap money for the time being is creating an illusion of an economy on the mend by shoring up the stock indices but in the final analysis is deferring massive problems to the future. The stress has not been relieved but continues to build up and when it finally bursts, Bernanke's effort will be laid bare as a hopeless patch-up job. The futility of this effort can be viewed in the Q3 2012 US total credit picture (left chart), in which the businesses appeared to have increased their credit growth. Under normal conditions, this would be favourable to the economy. But as explained earlier, the increase in credit was offset by a decrease in equities. So there was no impact to spending. If we exclude this growth, there was no credit growth by all sectors except that contributed by the US federal government. 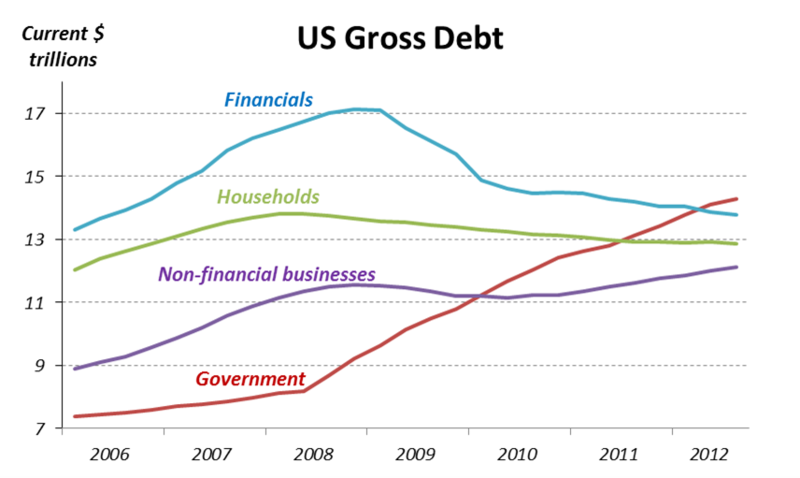 Extending this trend ahead, the credit outlook for Q4 2012 and for future years would appear bleak indeed. As a percentage of GDP (left chart), the picture is worse still. 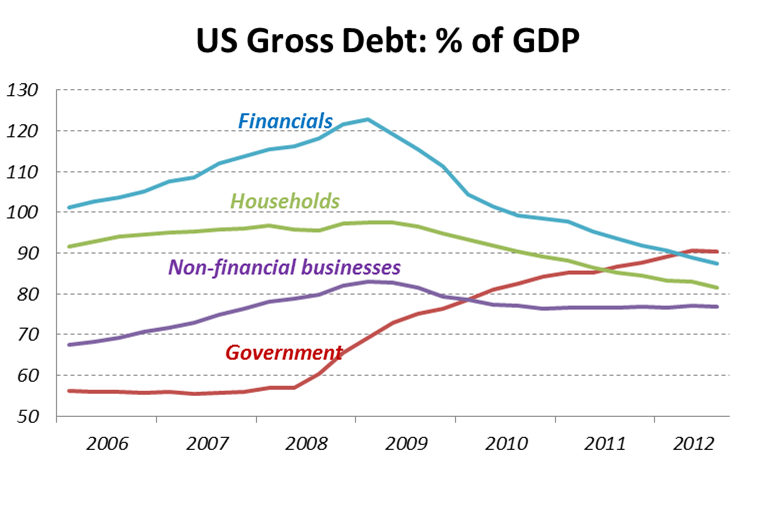 Even the government debt is flagging. indicating that we have reached a turning point. The 0.2% improvement in the latest unemployment rate is meaningless as the labour force participation rate in the same survey shows a retrogression of a similar percentage, down from 63.8% to 63.6%. With the slow but relentless fall in credit quantity, money will be hard to come by. For the immediate term, the most secure investment is the US treasuries but over the medium term, real physical cash is king. There's no risk of loss in value. For the long-term, that is 50 years from now, only precious metals serve as the only means of wealth accumulation as nation-states start crumbling and national paper money will disappear along with its issuing nations. However an economy is not about wealth accumulation, rather it is more about wealth generation and consumption and in this sense, locally issued paper money serving the local community and circulating only within it would ensure that wealth gets produced and consumed within that self-contained community.